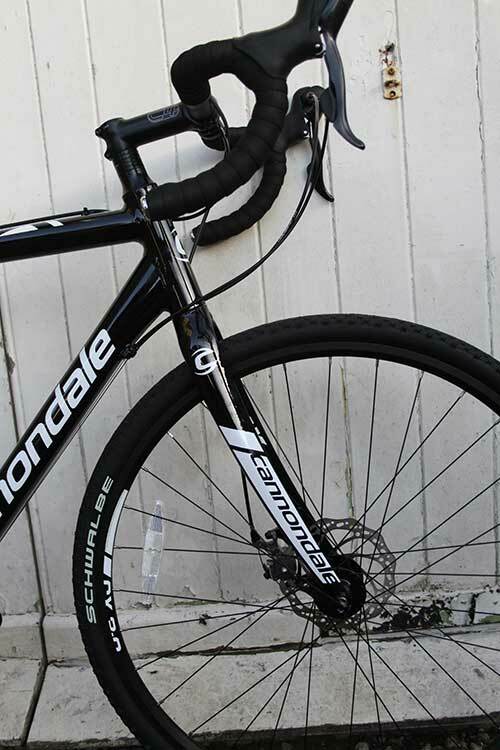 My Cannondale CAADX is still running exactly as it came out of the shop, with it’s Sora groupset and bog-standard wheels… all unchanged apart from the rear derailleur jockey wheels. It’s a terrific set-up for a winter commuter, but it needs to lose some weight for the winter cyclocross racing. I know that changing the groupset will lose some weight, and I’ve pretty much decided to go to 11-speed Shimano 105, rather than Ultegra 6800, to save some money to invest in the wheels. Unfortunately that wheel decision is proving to be harder than you’d expect. Tubeless wheels have been around for years and we’re using them to great effect on our mountain bikes – I have an identical Giant Anthem to a mate (same size, spec, etc), apart from the wheels that I swapped for Easton XC tubeless numbers and the difference in weight (when lifting the bikes over fences in the middle of Salisbury Plain) is noticeable. So, while the pure cyclocross racers are committed to tubular tyres, I’d rather go with a technology that I understand, and you’d think that this would be easy… but it isn’t. The core to the problem is that mountain bike and road bike hubs vary in size, and the cycle industry is slow adopting disc brakes AND tubeless tyres for the road. You can get good tubeless wheels (see my Shimano RS61s) or disc brake wheels, but it’s hard to get both in the same package. I can understand to some extent why road bikes might benefit less from a tubeless tyre, given that the high tyre pressures mean less pinch punctures (a key benefit of tubeless technology) and obviously no need to run the low pressures that tubeless offers. The problem I’m finding is that there are some great road wheels that offer a disc brake, but none (at least at a competitive price point – sub-£300) that also offer tubeless capability off of the shelf. o – Mavic Aksium Disc – £135 (RRP £160) – 1965g for the wheelset, but not tubeless ready. o – Mavic Ksyrium Disc – £275 (RRP £325) – @1700g, and again not tubeless ready. o – Kinesis CX Disc – £240 (RRP £300) – 1555g, and still not tubeless ready. I’m hearing rumours that Fulcrum are on the verge of bringing out some disc-specific wheelsets that will be tubeless, probably based on their 5 and 7 ranges, but even the dealers haven’t had this confirmed yet. o – Shimano CX75 hub – but they’re expensive. o – Shimano XT – but these are literally only just hitting the streets in the 11-speed form that I’d need. So where does that leave me in the time-being? As the wheel decision is proving to be such a minefield and is moving quite quickly at the moment, I was getting close to sourcing some Aksiums as a cheap stop-gap solution, but I think my best option is to take a step back on the wheel search and get the groupset upgraded… and see how what the options are towards the end of the summer, just in time for winter racing to start. Have you looked at Superstar hubs or their wheelsets? If you don’t want the expense of Hope they could be exactly what your looking for. Easy maintenance and I’m happy with mine.